TORONTO, February 6, 2019 – Toronto Real Estate Board President Garry Bhaura announced the release of TREB’s fourth annual Market Year in Review and Outlook report, in conjunction with a morning event consisting of multiple presentations and panels concerned with the housing market and broader economy. The media are encouraged to attend (see event details below). 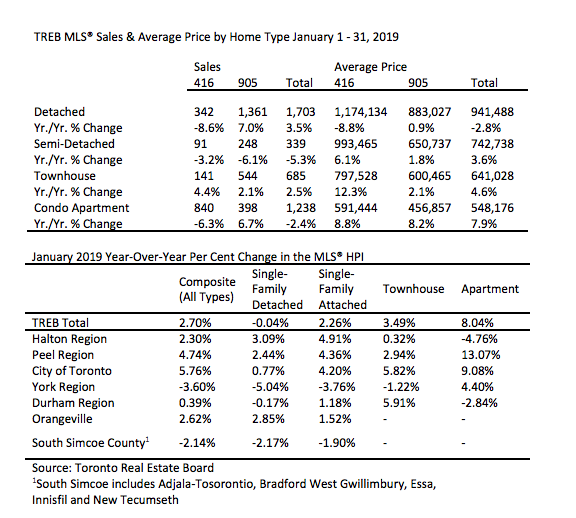 TREB MLS® System statistics for January 2019 are also provided below. This year’s Market Year in Review and Outlook report follows a volatile year for the housing market in 2018. Moderate improvement in terms of sales and average selling price is expected for 2019. “Although we won’t experience record levels, we do expect to see a better year in 2019 for sales and selling prices reported by GTA REALTORS® through TREB’s MLS® System. Many buyers who moved to the sidelines over the past year due to various government policies, including the OSFI-mandated mortgage stress test, have re-evaluated their positioning in the marketplace vis-à-vis home type, location and price point. It makes sense that Ipsos, in its Home Buyers Survey conducted for TREB, found that the share of intending home buyers has increased,” said Mr. Bhaura. “Even though we’re seeing positive government action on a number of key housing files, one area that needs to be revisited is the imposition of the OSFI-mandated two percentage point mortgage stress test. While we saw buyers return to the market in the second half of 2018, we have to have an honest discussion on whether or not today’s home buyers are being stress tested against rates that are realistic. Home sales in the GTA, and Canada more broadly, play a huge role in economic growth, job creation and government revenues every year. Looking through this lens, policymakers need to be aware of unintended consequences the stress test could have on the housing market and broader economy,” said John DiMichele, TREB CEO. • 83,000 sales are forecast to be reported through TREB’s MLS® System in 2019 – a moderate increase compared to 77,375 sales in 2018. This moderate increase will be underpinned by an uptick in the number of people considering a home purchase, as reported by Ipsos, which will be supported by continued population growth, low unemployment rate and lower average fixed-rate borrowing costs compared to 2018. Slightly tighter market conditions, similar to those observed in the second half of 2018, will support a moderate pace of price growth in 2019. The average selling price in the Greater Toronto Area will increase to $820,000 – close to the peak reached in 2017 and up from an average of $787,195 in 2018. The condominium apartment market segment will continue to be the driver of price growth, whereas average detached home price growth will be below the average growth rate for the market as a whole. Ipsos results confirm that the OSFI-mandated mortgage stress test has negatively impacted affordability. TREB analysis found that, on average, home buyers had to qualify for monthly mortgage payments almost $700 above what they will actually pay. In order to account for the higher qualification standard, intending home buyers have adjusted their preferences, including the type of home they intend on purchasing. The Ipsos Home Buyers Survey found that the share of buyers intending to purchase a detached home is at the lowest level since the fall survey was introduced in 2015. Higher density home types, which have a lower price point on average, have become more popular with intending buyers. Notwithstanding the brief spike in 2017, new listings entered into TREB’s MLS® System receded back to the post-recession norm in 2018, hovering between 155,000 and 156,000. The expectation is that the new listing trend will remain relatively flat in 2019. The Ipsos Home Owners Survey pointed to a slight dip in listing intentions this year. The rental market in the GTA is expected to remain tight in 2019, with low vacancies underpinning annual average rates of rent growth in the high single-digits or even low double-digits for one- bedroom and two-bedroom condominium apartments leased through TREB’s MLS® System. The supply of rental units could continue to be problematic in 2019. The Ipsos Home Owners Survey found that almost two thirds of investor-owners are thinking about selling one or more of their units over the next year. The existence of rent controls on these units could arguably be prompting this thought process.“Despite some uncertainty regarding economic growth over the next year, many traditional housing market drivers remain in place. The GTA population will continue to grow over the next year, as people are attracted to the GTA by the region’s diversity of job opportunities. Unemployment is expected to remain very low and home buyers are expected to benefit from lower fixed mortgage rates, on average, compared to 2018,” said Jason Mercer, TREB’s Director of Market Analysis and Service Channels.“Ipsos surveys consistently find housing to be top of mind for Canadians. In the fourth quarter of 2018, housing was ranked as the third most important issue Canada-wide and second most important issue in Ontario. This suggests that housing policy should also be top of mind for both the relatively new provincial government in Ontario and federal party leaders who have an election on the near horizon,” said Sean Simpson, Vice President at Ipsos. This year’s report envisions housing options and supply for liveable communities and puts the focus on how transit-supportive development and the creation of more “missing middle” (townhouses, row houses, duplexes, etc.) might offset housing affordability issues seen throughout the Region. In addition to contributions on these topics from the Pembina Institute and Ryerson University’s Centre for Urban Policy and Land Development, respectively, TREB also garnered submissions from several regional policymakers, including Mayors John Tory and Bonnie Crombie. “Transit-supportive development is a key strategy for cities to build vibrant and compact communities within walking distance from transit – places with a balanced mix of housing, jobs, and shopping. Intensification around GO stations can help the GTHA strategically increase housing supply and choice and help individuals and families reduce their housing and transportation costs. GO stations and lands surrounding it are a significant public asset, so let’s not miss out on the opportunities that allow people to access more housing options, live active lifestyles, and access transit close to where they live,” Carolyn Kim, Director, City Building, Pembina Institute. The Pembina Institute’s research for TREB examines two real life case studies in the Greater Golden Horseshoe and shows that housing built within a ten minute walk of a transit station, and in areas that feature a balanced mix of housing, jobs, shopping and services, can result in potential housing and transportation savings ranging from 10 to 56 per cent for individuals, families and retirees. “The lack of supply of missing middle housing in Toronto is due to a few key factors that fall into the hands of municipal policy makers. It is up to the Council of the City of Toronto to loosen supply-side constraints so the city can offer people what they want – affordable, missing middle housing,” Frank Clayton, Senior Research Fellow, Centre for Urban Policy and Land Development, Ryerson University. The Ryerson University Centre’s research for TREB offers some workable ideas on how to create more missing middle housing, which could fill the gaps in the types of homes needed and positively impact affordability. Currently, only 25 per cent of the City’s housing stock is missing middle housing (commonly defined as townhouses, row houses, duplexes, etc). Building more of this type of housing could provide more affordable family friendly options resulting in savings ranging from 20 to 49 per cent in the average price of housing according to the Centre’s research. The study goes on to conclude that if Toronto’s predominantly single detached neighbourhoods were opened up to missing middle construction, it could add over 200,000 units over a 30-year period. Altus Data Solutions provided up-to-date statistics and analysis on the new home and residential land markets in the GTA, providing insight into new housing supply that came online in 2018 and what is in the pipeline moving forward. TREB President Garry Bhaura announced that Greater Toronto Area REALTORS® reported 4,009 home sales through TREB’s MLS® in January 2019 – up by 0.6 per cent compared to January 2018. On a preliminary seasonally adjusted basis, sales were up by 3.4 per cent compared to December 2018. The MLS® HPI Composite Benchmark price was up by 2.7 per cent compared to January 2018. The condominium apartment market segment continued to lead the way in terms of price growth. The average selling price was up by 1.7 per cent on a year-over-year basis. After preliminary seasonal adjustment, the average selling price edged lower compared to December 2018. “Market conditions in January, as represented by the relationship between sales and listings, continued to support moderate year-over-year price increases, regardless of the price measure considered. Given housing affordability concerns in the GTA, especially as it relates to mortgage qualification standards, we have seen tighter market conditions and stronger price growth associated with higher density low-rise home types and condominium apartments, which have lower average selling prices compared to single detached homes,” said Jason Mercer, TREB’s Director of Market Analysis and Service Channels. At 9:30 a.m. today at Parkview Manor in Toronto (55 Barber Green Road), TREB will release its fourth annual Market Year in Review & Outlook Report at an Economic Summit. All media are invited to attend. The event is closed to the public. The full report can be downloaded today at 12:00 p.m. from www.TREBhome.com.